Evolution Motorsports Sport Exhaust PORSCHE - Dezod Motorsports Inc - Home of the automotive performance enthusiast since 2002. POWER, SOUND, QUALITY, RELIABLE, SOPHISTICATED are all words that describe the Evolution Motorsports Sport Exhaust. The design of this system combines all of the power associated with a sport exhaust system with the sound quality you expect and your Porsche deserves. The Evolution Motorsports Sport Exhaust offers a pure clean crisp sound while maintaining a quiet interior cabin without annoying resonance. 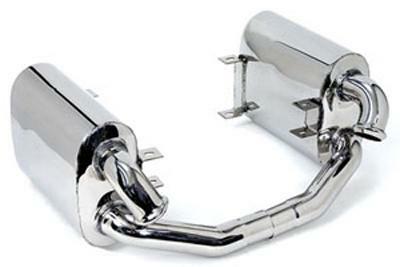 Every component of this stainless steel performance exhaust is hand built by skilled craftsman who take immense pride in their work. All components utilize hand crafted 304 stainless steel, smooth mandrel bent tubes and are then finished with a show quality polished. All systems are designed for optimum performance, reliability and sound quality.